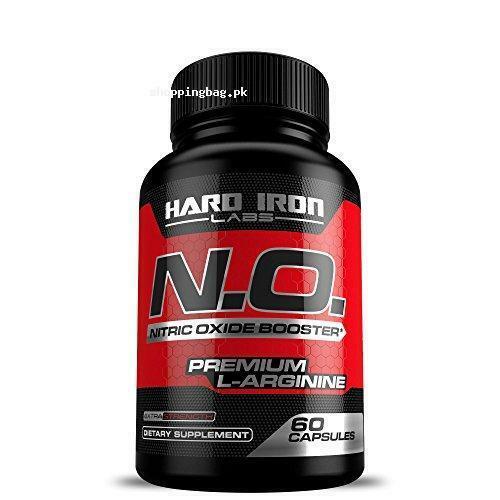 Hard Iron Labs Nitric Oxide Supplement comes with premium L-Arginine. The premium N.O boosting formula improves the energy level and helps in building lean body mass. It is ideal Dietary supplement for athlete, sportsmen, bodybuilder, weight lifter, etc. Buy the 60 capsule pack, supply for 1 month, via Amazon online shopping in Pakistan. ✔️ 100% MONEY-BACK GUARANTEE- Try out products with no worry or risk. We back all of our supplements with a 60-day money back guarantee, no questions asked. With Hard Iron Labs you know that you are only getting the highest quality ingredients, manufactured with the strictest standards in the industry and 3rd party tested for purity. ✔️ SUPERIOR NITRIC OXIDE BOOSTER WITH PREMIUM L ARGININE - Feel the difference, we use a superior blend with two forms of L-Arginine and two forms of L-Citrulline. Powerful precursors to Nitric Oxide production. Our formula is the ultimate synergistic blend of premium quality ingredients to ensure the best benefits possible! ✔️ VASCULARITY, BLOOD FLOW, BIGGER PUMPS, PERFORMANCE, HEART HEALTH AND GAINS - Our Premium L-Arginine blend boosts energy levels and helps build lean mass. By increasing blood flow via vasodilation. Our formula is perfect for weightlifters, athletes, runners and everyday people. As men age, it is important to use supplements to stay healthy. With our extra strength Nitric Oxide Booster with Premium L Arginine formula, you can put an end to the dreaded effects of aging. ✔️ ESSENTIAL TO A HEALTHY LIFESTYLE- L Arginine is an essential amino acid that converts into Nitric Oxide, by relaxing blood vessels and improving blood flow. This is very healthy for your heart and can also be used as a workout supplement. N.O. supplementation will improve blood flow by expanding your blood vessels. This allows more oxygen to your muscle, brain, heart, lungs, & other organs. This means better performance, more muscle gains, and most importantly making you healthier. ✔️ RELATED: nitric oxide supplements pre workout boosters 40 a1 arginine benefits best blood body bodybuilding boost booster calcium capsules collagen compound daily effects eiyo fiber foods formula fuel gas good high increase iodine iron l-arginine lozenges magnesium men name natural neo nitrate nitrite nitro nitrogen nitrous no no2 no3 nx6 pills potassium powder pressure protein shakes sheer side hard iron labs supplement synthase women xplode zinc.